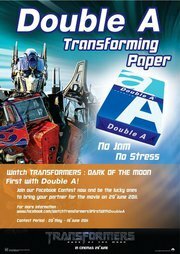 Thanks Double A Malaysia for organising Transformer 3: Dark of the Moon movie premier at GSC 1 Utama on 29th June 11 night. Since It's a 3D show which means where you sit is very important hence I went to their office in Jaya 33 to collect the tickets in advance. I have chosen the corner 2 seats of 4th row from back(Middle seats was all fully occupied). Now share with you the Double A goodies bag, there are cool Transformer notepad and cute little mini Double A paper ream which I like very much. Thanks Double A again for the movie and the experience of done my very 1st questionnaires in cinema.